The human face portrays so much – how you’re feeling today, your opinion on a topic, your reaction to a surprise, and even your age. The eyebrows contribute a great deal with how our face looks to others, thanks to all the small facial muscles that control them. When you get older, however, your eyebrows can sometimes portray a feeling or opinion that doesn’t actually match what you’re thinking. This is because age causes the face to wrinkle and sag over time, which pulls your eyebrows downward and causes you to appear tired, angry, or sad. A brow lift can improve the overall appearance of your face by pulling your eyebrows back to a more youthful position. The doctor will begin by placing the patient under general anesthesia. Once the patient is asleep, the doctor will begin making his or her incisions. These incisions can be placed in different ways, depending on what kind of improvement the patient is looking for. One option is a coronal incision, which is made along the top of the head from ear to ear. Another is a temporal incision, which is a set of incisions made on the sides of the head, just behind the hairline. Sometimes the doctor may need to make a few small incisions rather than one long incision. Whichever method the doctor chooses, once the incisions are made, the doctor can gain access to the underlying muscles that control the eyebrows. The muscles can be tightened or pulled from here as needed. If necessary, the doctor can also tighten the skin by pulling and suturing the skin back to the original incision(s). In general, patients require one to two weeks of downtime after surgery before resuming normal activities. There will be some bruising and swelling around the sutures, plus some pain and discomfort in the forehead. Patients can use cold compresses to manage the bruising and swelling, and the doctor will prescribe pain medications for the rest. Patients should keep their head elevated as much as possible and avoid moving around too much. The doctor will also provide a set of post-surgery care instructions for the sutures. If you are a healthy person who is generally satisfied with your appearance, you are a good candidate for a brow lift. Brow lifts are designed to keep a patient’s facial structure the same while making it appear more alert and younger. This procedure can also be combined with other facial lift procedures, which is great for those with multiple problem areas. During your consultation, the doctor will assess your face and talk with you about your goals, then make a determination on the best course of action. 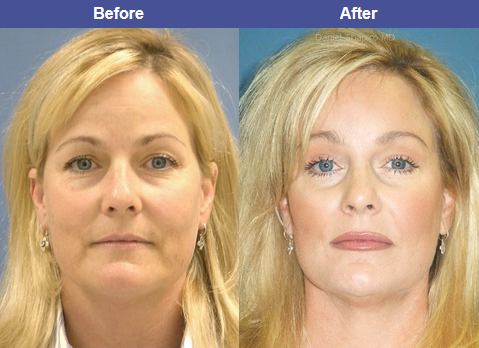 Brow lifts are one of the many procedures we offer to our patients here at Shapiro Aesthetic Plastic Surgery. If you are interested in learning more about any of our surgical and nonsurgical options, contact us at (408) 451-1700 to schedule an appointment with Dr. Shapiro, a renowned Scottsdale cosmetic Surgeon who is board-certified with over 19 years of cosmetic surgery experience.